My YouTube channel currently has more than 500 videos that I have created to demonstrate all kinds of ed tech tools for everything from creating videos to saving time while grading quizzes to mapping a safe biking route for your kids. And for the last two months I have been using my YouTube channel to host live Q&A sessions that I call Practical Ed Tech Live. Join me on my YouTube channel tomorrow at 3:30pm EDT. 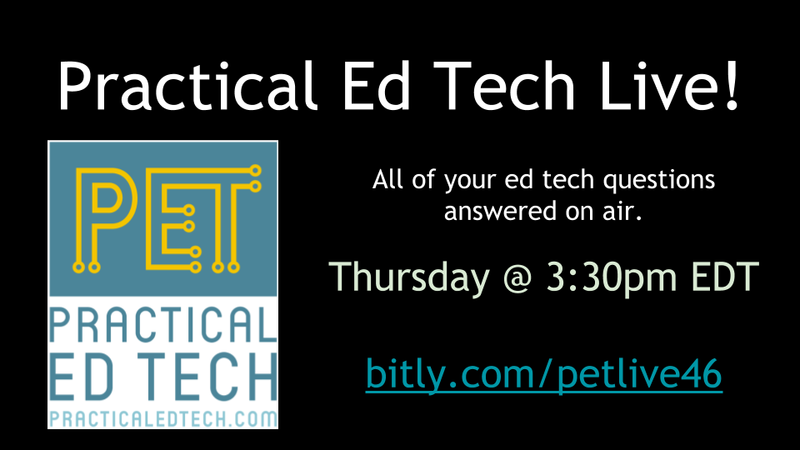 You can join me on my YouTube channel or on the Practical Ed Tech Facebook page. I'll answer your questions live as they appear. I'll also answer questions that are sent to me in advance via email or Facebook.